Blood and Brains: The Zombie Hunter’s Guide is a .pdf written for the d20 Modern system. Written by Michael Tresca, the work focuses on both familiar and unfamiliar elements of the zombie mythos. The .pdf is written extremely well, Tresca’s experiences within the gaming industry definitely shine through in his writing. The language has a conversational tone, and is written in the second person. While the intended audience is “zombie hunter,” the .pdf’s focus shifts back and forth from player to GM back to player again. Writing for a dual audience is no doubt challenging, however some information would have been easier to read only if it was organized differently. The zombie mythos was researched thoroughly, its details apparent from the Introduction section to the ingredients for Zombie Powder. Many tables for stats and other goodies, like modifiers for arm/hand prosthetics, flesh out the d20 modern mechanics. 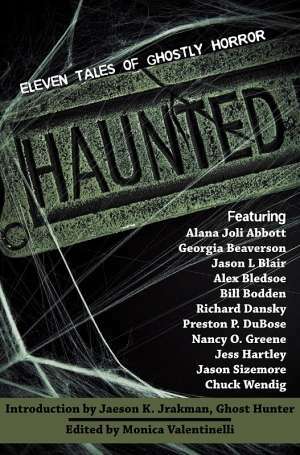 Playing a zombie hunter requires a day job, and Blood and Brains offers several occupations to choose from in Chapter 1. While these are themes seen in other zombie RPGs, it is promising to see the zombie mythos continued through to d20. One occupation as a NCRPC (National Center for Reanimation Prevention and Control) employee offers a different twist on government involvement. A table that is devoted to NCRPC gives more information. 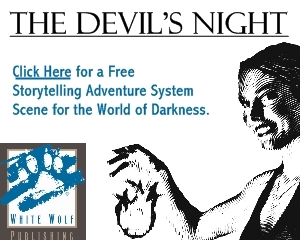 The involvement of this organization in a game setting looks like a lot of fun to play. The Characters section progresses to advanced classes. In addition to the Zombie Hunter character splat, Blood and Brains offers splats on Necromancers, Bokors, Mad Scientists, and Psychokinetics. Pay special attention to the different abilities that each of these classes offer before choosing a character, enhancements are also included in this .pdf. With all the power that characters such as Necromancers may offer, Blood and Brains offers a checks-and-balances mechanic called “Madness.” This mechanic is used on all characters, and regulates play to a more manageable level. As a complement, a “Trust” mechanic is also offered as a means of encouraging players to work together. For anyone who’s ever played a zombie game, teamwork is key to survival. The Trust mechanic can come into play in several situations. Blood and Brains devote a lot of its time expressing different avenues for zombie creation and zombie types. Encompassing aspects from film, fiction, and folklore, enough variety is offered within the .pdf to satisfy anyone’s taste. Other monsters relevant to the setting are also included here, with a science fiction surprise. Creating a workable .pdf that is both easy to read and easy to print can be a challenge. Blood and Brains is up to the task. The artwork, designed by John Longenbaugh, translates well to print and its quality is consistent throughout. The key feature of Longenbaugh’s work is that it enhances the .pdf rather than distracts from it. The zombie hunter’s guide ends with game-inspiring fiction rather than with a conclusion. The fiction does well to tie the class elements together and show a very, different twist on the subject. 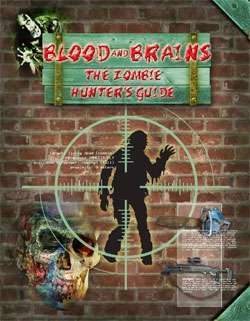 Overall, Blood and Brains: a Zombie Hunter’s Guide is an extremely ambitious work given the ground it covered in its 67 pages. Useful to GMs and players, the guide is just that, an information-packed overview to play the setting. Reading it will inspire any d20 fan to create a multitude of settings.